Should you detox your liver? Home » Liver » Should you detox your liver? In January, many of us compile of list of New Year resolutions that often consist of becoming healthier. During this time of the year, there is mention of detox and cleanses, but what are these and do you really need to do one? First things first, your body is equipped with its own natural way to detox, which is done with the help of the liver. Anything that enters the body becomes filtered through the liver, which in turn helps detox the body. It is true that during the holidays, we tend to go a bit overboard with too much food, sugar, and above all, alcohol. Many of us feel that we need to detox our bodies to help rid of us of all this excess. 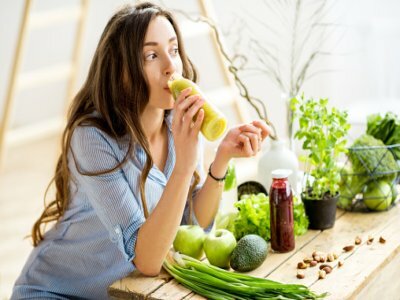 While some people detox by simply cutting back on alcohol intake or reducing their sugar consumption, others take the term detox to a more extreme by eliminating certain food groups or even meals and instead replacing them with supplements or juices. Everywhere you look, there is someone promoting a juice cleanse as a means to rid your body of harmful toxins. They suggest that your body needs a detox because it simply cannot do it on its own – but this isn’t entirely true. In some cases, such as alcohol dependence or drug overdose, detoxing is necessary to rid the body of alcohol or drugs in order to get past those addictions. But do our everyday habits require detoxes? Our body as a whole works together to ensure it stays “clean” by filtering toxins through the blood, urine, and bowels. Although some people encourage special products to aid in this detoxification, it really isn’t necessary. In fact, all you need to do is cut back on unhealthy foods that are high in fats and sugar. Some supporters of juice cleanses and detoxes suggest that modern life exposes us to far more toxins, which is why detoxes are so necessary. The real problem with many cleanses and detoxes is that although they all claim to remove toxins, they aren’t specific as to what toxins are being removed or how exactly this process is completed. On the other hand, some companies may make false claims about the benefits of detoxes which, in fact, are not true nor do they have scientific evidence to support them. “It’s barmy. The kidney works extremely well to maintain the internal function of our bodies. Of course, we stress it at times, but essentially it copes with everything we throw at it very well. There are lots of things you can do to maintain your health – eat less salt and fewer calories, do some exercise – but what you can’t do is get it in a bottle or rub it on yourself or anything else,” continued O’Donoghue. Another issue that arises is the claim that intaking your fruits and vegetables as a juice is far more effective than eating them whole. This is also false. Pressed juices are not any healthier than the fruits and vegetables themselves. If you feel that you are “toxic” and looking to detox, then simply change up your diet. Remove junk foods, fatty foods, saturated and trans fats, alcohol, increase your water intake, and exercise regularly. If you do that, you will feel better overall. Is your diet making your liver sick?